So newly appointed Benghazi select committee chairman Trey Gowdy has been decrying the idea of Republicans fundraising off Benghazi (ironically, at the exact moment Republicans were fundraising off Benghazi). The ConWeb has not gotten the message. Media Matters catches Accuracy in Media seeking to raise money to fund its "Citizens' Commission on Benghazi" kangaroo court. But AIM isn't the only one. We have a smoking gun in the Benghazi cover up scandal: emails tying the White House to Susan Rice's false talking points about the terrorist attack. Finally, there’s proof that this administration lied about the terrorist attack in order to protect the President during his reelection campaign. This is earth-shattering news. But guess what? The media are for the most part covering up the smoking gun! That the so-called “news” media refuse to report a smoking gun in one of the biggest scandals in modern history is a major scandal in its own right! 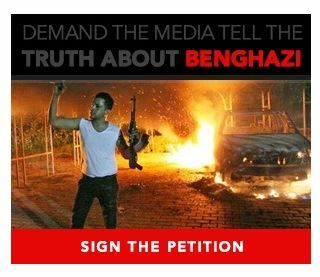 Signing the website's petition to "demand that the media stop censoring the news about Benghazi" takes you toanother page that solicits donations that "will enable us to build a grass roots army that we can unleash on the liberal media to demand that they tell the truth." 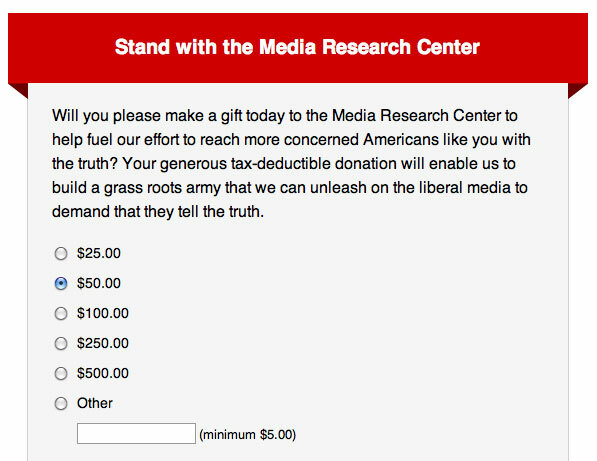 But the MRC's campaign -- and the right-wing media's Benghazi obsession in general -- seems to demonstrate that this is much less about telling the truth than it is about raising money and motivating the base.